ConductRF's latest innovation is Hi-Frequency RF Jumper Cables with 2.92mm, 2.4mm or 1.85mm connectors as standard. 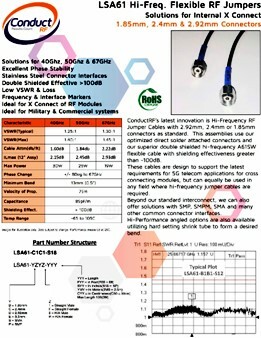 This assemblies use our optimized direct solder attached connectors and our superior double shielded hi-frequency A61SW flexible cable with shielding effectiveness greater than -100dB. These cables are design to support the latest requirements for 5G telecom applications for cross connecting modules, but can equally be used in any field where hi-frequency jumper cables are required.